There a lot of video games I remember from my childhood – things for good old Windows 95. 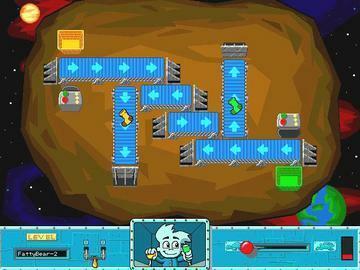 Point and click, semi-educational, often musical fun stuff. The trouble is I often only remember part of them, and we haven’t had the games for a long time, so it’s very frustrating because I might just have a scrap of noise or an image stuck in my head! 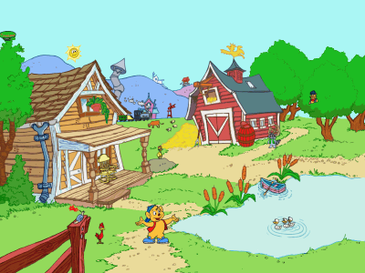 I often talk to my mother about old games trying to remember, and just then she helped me remember Howie’s Tuneland! A bear is voiced by Howie Mendel and takes you through a little world filled with nursery songs and funny animations. 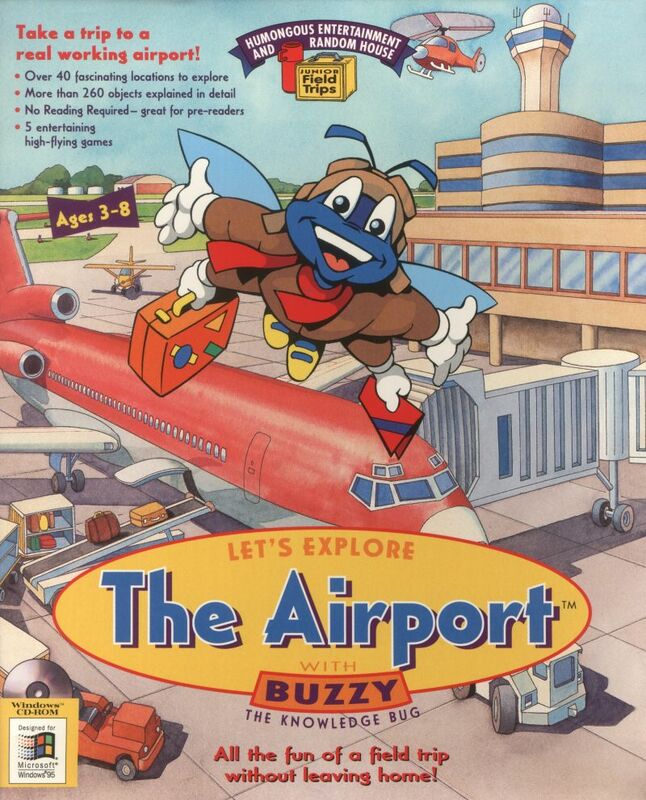 I also remember playing Buzzy The Knowledge Bug games, and visiting the Airport, Farm and Jungle! Playing Anteater Feeder, and another game where you caught chicken eggs in a basket. Other games from ‘Humongous Entertainment‘ I loved were Fatty Bear’s Birthday Surprise and Putt Putt And Fatty Bear’s Activity Pack, Putt Putt and Pep’s Balloon-O-Rama, Freddi Fish and Luther’s Maze Madness, Freddi Fish Case Of The Missing Kelp Seeds, Freddi Fish Case Of The Haunted Schoolhouse, and Pajama Sam’s Sock Works! Let the picture spam commence! Another game I liked as a kid (but couldn’t find very good pictures of) was ‘Funny Monsters For Tea‘. You were a little boy, and monsters showed up, and stuff happened – not scary threatening stuff, the monsters just wanted to joke around and play some music. Then there are games I don’t remember much of, or can’t even think of what they’re called. I remember a green dinosaur sniggering behind its hand, and Mum said it might be from ‘Theres A Dinosaur In The Garden‘, which was one of the Packard Bell games we got with our first computer. I’m not sure, but I read about a dinosaur eating with a knife and fork in this game, and that rings a bell. A game I couldn’t remember, but just Googled and found results and now remember, is Rumpelstiltskin’s Labyrinth Of The Lost. Basically the story of Rumpelstiltskin and the miller’s daughter, but she has to go into a Labyrinth to retrieve golden orbs for Rumpelstiltskin (idk why, maybe were for a necklace or for him to trade or make something? ), to get him to spin straw into gold for her, and then later she has to go back in to find his name or else he’ll take her child. 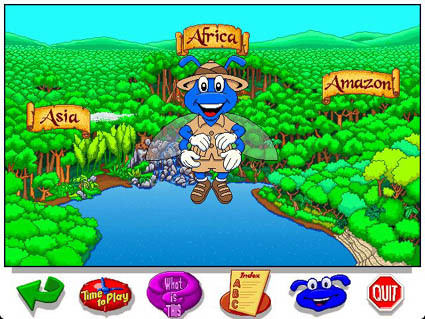 There was also optional trivia type questions before you could take an orb. I think we also had Hansel And Gretel And The Enchanted Castle, but I don’t really remember it so much – I only realise we owned it because it was by the same developer as the Rumpelstiltskin game when I was researching, and the children and title are very familiar. A game I sadly could not find despite my Googling, is a game featuring a rainbow fairy that glows in the dark. I remember (I think!) she was blonde, and she wore a little pink dress, and had pretty wings (that she possibly lost at some stage?) and they were rainbow coloured and when it was dark (like when she was in a cave) they glowed in a dark. There were also other fairy-ish things, like mushrooms and snails and stuff. Quite a few of the games I mentioned I think you can now download online, but I haven’t tried it yet. I think one of the Freddi Fish games is on Wii. I hope this has been vaguely interesting or helped any one else to remember their favourite childhood games! It makes me wish I had been homeschooled properly as a kid, just so all these games would count towards it, lol >>; I wish I could still play games like these and have it count as work! !